Soto Ayam is an Indonesian chicken soup, with the light and savory flavors that represent that style of cooking. It's healthy, delicious and easy to make. I have been waiting this moment for a long time to continue writing in my blog. I feel ashamed for not making this passion my priority. I suppose, in a way, I was afraid to start writing my blog again… it’s like that feeling you have before you meet a friend that you have not heard from for 10 years! I think I was mostly afraid that I will eventually abandon it again… well today is the day of days (another one of those days ^^), I decided that I will start again no matter what happen next! I assure you though, I have not stopped cooking since my last post 3 years ago (OMG it has been that long -.-), and I believe I got slightly better at it. As this is a special post (I think I said that about my last post), I would like to share the recipe of one of my favorite dish. 1. Remove the giblets from the chicken; discard or save the liver for another use. Wash the chicken and rub it with 1/2 teaspoon of the salt. Set aside. 2. Heat the oil in a skillet over high heat. Add the chopped shallots, lemongrass, garlic, ginger, black pepper, and turmeric. Cook, stirring constantly, until the aroma is apparent, about 30 seconds. Remove from the heat. 3. Combine the broth and remaining 1 1/2 teaspoons salt with the chicken, giblets, and shallot mixture in a soup pot. Bring to a simmer and cook until the chicken is cooked through and tender, about 45 minutes. Skim often to remove the foam that rises to the surface during simmering. 4. Remove the chicken from the broth and, when cool enough to handle, remove the bones from the chicken. Return the bones to the broth and continue to simmer for another hour, skimming as needed. Meanwhile, dice the chicken meat and set aside. 5. Place the potatoes in a saucepan, cover with cold water, and bring to a simmer. Cook until tender, about 20 minutes. Drain and spread the potatoes in a single layer to cool. 6. Soak the beans threads in hot water to cover until tender, about 5 minutes. Rinse and separate the strands under cool running water. Chop into 2-inch pieces and set aside. 7. When the broth has simmered for an hour, strain it through a fine sieve. Mix the soy sauce, chili paste, and sugar together; stir into the strained broth. 8. Add the diced chicken meat, cooked potatoes, soaked bean threads, scallions, chopped eggs, and celery to the broth. Bring to a simmer and add a squeeze of lemon to taste. 9. 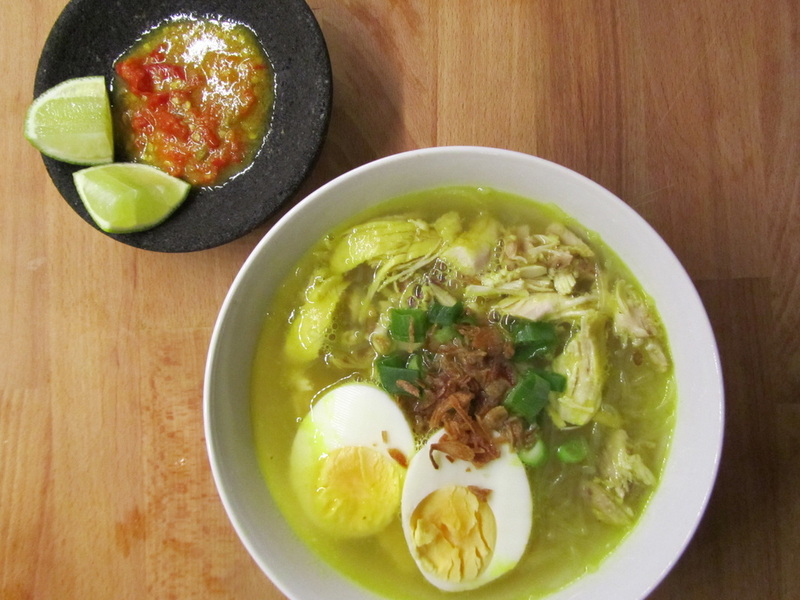 Indonesian recipes like this tasty soup are nice served in heated bowls, garnished with fried shallots. Pass lemon wedges on the side. The list of ingredients in this recipe may look long, but the recipe is quite easy to make. The seasonings and vegetables added really up the flavor level. Asian soup recipes are a great way to introduce yourself to new flavors and ideas. With a few simple ingredients you can take yourself to a whole new culinary world. Soups like this are also incredibly healthy for us.